Shannon does not have it all but she does have goals for summer vacation that won't see her sitting idly by. Not bad goals for a girl of sixteen! Life does take a turn in this story though and sometimes reality is harder to believe than fiction. No matter how you plan it seems that life often takes those unexpected turns. Summer vacation has just begun and Shannon learns that her mother's parents are alive. Not only alive but they are Amish! Shannon and her chronically ill mother are to take the bus to Ohio the very next morning so that her mother can get well again. Hard to absorb this piece of news, it is harder yet when Shannon gets off the bus and waits for her uncle to pick them up in a horse and buggy. As Shannon is adapting to living a plain life she is captivated by a young Amish man named Ezra who has all the looks and charms to sweep her off her feet. His smooth talking ways are sincere to Shannon, who has just met her first love. Is he truly in love with her? Would he love her more if she converted to the Amish faith? Would her mother's family accept her more too if she became one of them? Her mother, Anna, is not improving and Shannon is faced with serious decisions to make that are not supported by her Amish family. She must take responsibility and come into her own identity. This is a coming of age story unlike many you have read. Melody Carlson tells a story of love and being true to self. I love how she weaves so many ideas through the story. A simple life is not as simple as it looks. Anyone who lives past their teen years knows from experience they are difficult in and of themselves. I am impressed with the well written plot and character development of My Amish Boyfriend. My granddaughter saw my copy on my desk and is waiting to borrow it. It will be a fun book to discuss with her and I am sure we will talk at length of the characters. I wonder how she will react when she sees the plot twist and turn; I wonder what she will say about Ezra and his loyalty to his faith and family. This is the first time I have read one of Melody Carlson's books and I understand her appeal to young readers. The characters are easy to identify with and the story keeps the reader's interest. In the years following the Civil War, a young woman named Cassie Haddon and her mother struggle after losing everything. How can two women used to living a life with servants in a fine home make it on their own. The story unfolds to show how determined Cassie was to step in to provide a home for her mother. With no skills this proves difficult. In the predictable sense of a good story, she finds a job and works hard to build a home for herself and her mother. What is important is how she accomplishes this in a time when ladies don't work with their hands and need the protection of a strong man. Ann Shorey's characters in this novel are strong people who represent the strength of character necessary to build the great country we live in today. Cassie's mother, a helpless widow used to fine things. Jacob West who owns the restaurant and grocery hailed from Boston. Wash and Becca, former slaves who come together for a new life in freedom. All of the characters in this story become as changed as the times they lived in. History, romance and a deep faith make Love's Sweet Beginning a good story to be read with a good cup of tea. Jill Eileen Smith has touched us again with her Wives of the Patriarchs series. Rachel, book three in this series is a compelling story of Rachel and her sister Leah, who both love and marry Jacob. Set in biblical times, this is the story of Jacob and his two wives. The author brings them to life and we experience their joys of love and agonies of deception. Jacob is deceived on his wedding night when his bride is switched for her sister. He wakes up in the morning to discover Leah, and not Rachel by his side. Thus begins the deception of Laban, father of both women and Jacob's uncle. The deception Jacob faced from Laban was cruel and inspired by greed. Jacob worked seven years to pay the bride price for Rachel only to be tricked into working another seven years to pay for her hand. Perseverance and faith in God dominate a story that is timeless in its humanity. Jacob's faith in one God, Adonai, inspired Leah's faith and over time she learned to persevere in her love and devotion. Rachel also abandoned the many gods of her father's people. She too began to love with an open heart and abandon life long jealousies between herself and Leah. Important biblical themes like jealousy and lust are timeless and the lessons learned are still important today. I was inspired by the love and patience in this story. Rachel forgives Leah and both women are stronger together than as rivals. It is hard to put myself into the stories of the bible at times of so long ago and the author captured the sights and sounds so well. In this story I can feel the wind on the desert and the sound of sheep. I encourage you to get this book and experience the romance and intrigue in Rachel's story. I have come away looking for more... and look forward to the next book in the series. 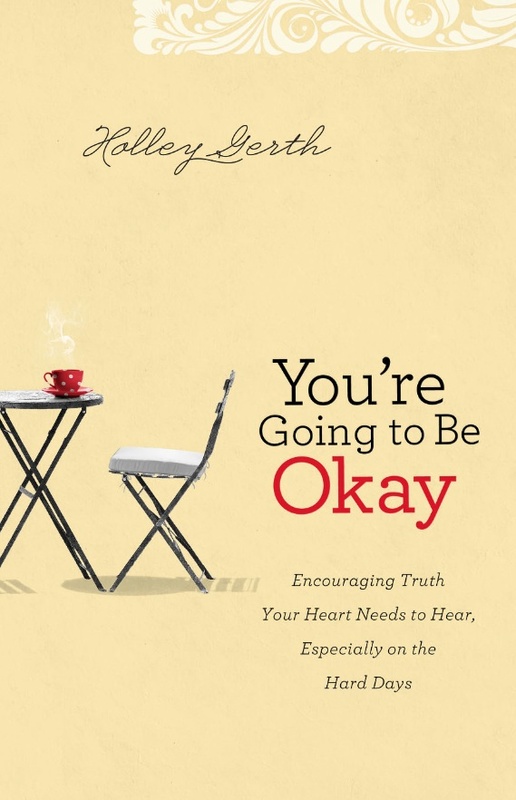 I am happy to review Holley Gerth's latest book, You're going to Be Okay. This book is well written with simple affirmations for every woman. Easy to implement strategies to help us all find God in our chaotic daily lives. So often we are mired in the depths of our weakest moments. We know the mind is powerful yet we do not guard our hearts from the negative thoughts that overtake our common sense. When we turn to God and feel His amazing love for us in all situations we will find healing. We can stop sabotaging ourselves, change our attitudes and make the most of our changes. How often do we tell ourselves so many negative things that we become small minded? We are made to be loved and to love. I liked having the questions for deeper study at the end of the book. Listed by chapter, this easy to follow guide is a good tool and easy reference to putting Holley's lessons into practice. We are all made for a purpose and my purpose is not tied to the negative thoughts that can try to intrude my mind. How freeing to push such thoughts aside and find peace with a guarded heart. I was up for a suspenseful mystery so the prospect of reading Shadows of the Past by Patricia Bradley was a reward after a long week. Taylor Martin is a Criminal Psychology professor with a specialty in criminal profiling. The story begins at a crime scene where Taylor has been called in to consult with Newton County Sheriff's Department. As the crime scene wraps up she feels inside her pocket and finds an alarming note imprinted with Meade Funeral Home imprinted on the top. She smells the hint of Old Spice wafting through the air. How did the note get inside her pockets? Is it written by someone who has been stalking her? The last offering was a bouquet of black roses. Could it be from a troubled young man who had taken a course from her the term before? At the scene she meets Nick Sinclair, a handsome writer from the south, not far away from Logan's Point, Mississippi where Taylor is from. Nick hides the detail that his brother Scott is the former student and suspected stalker. Things don't make sense to Nick; his brother was troubled but not a criminal. Just a troubled young man who had gotten in with the wrong crowd drinking and doing drugs. His attorney and administer of Scott's trust fund recommended Conway University so Scott could have a fresh start. It was far from his Memphis Tennessee home and former friends. Taylor heads back to Logan's Point and finds herself on the same flight as Nick Sinclair who is going home to Memphis. Taylor's father disappeared when she was quite young and she hopes for answers at last on why he disappeared. He went on a business trip, never to return again. Back in the South, the pieces begin to intersect both the lives of Taylor and Nick. They are strongly attracted to one another; there are puzzling bits of information though that threaten to doom any hopes of a relationship; beginning with Scott, the elusive brother, a large land deal for the Martin land and of course, how the stalker knew that she was in Logan's Point and not in Newton County, Washington State! Taylor presses on with questions on her father's disappearance and goes so far as to request police files on anything related to his disappearance. Her uncle Jonathon is trying to get everyone to agree to the sale of the property that has been in the family for generations. With ties to the underground railroad and historic preservation, he needs a majority vote in order to clear the way for a million dollar housing development. He has no time for Taylor's questions and want her to stop any further questions about his brother. A string of coincidences bring danger to Taylor, to Scott and to others who have information about what happened to James Martin. There are too many things that don't add up and Taylor questions who she can trust. As Taylor gets closer to the truth more than one life is in danger. Scott resurfaces and attracts danger too. Will he sober up or will he die? He is looking for his friend Digger who helped him at Conway and now in Tennessee. Nick fears for Scott's life, trying to protect him but also trying to find out the identity of Digger. There are so many questions and turns in the story before we find the truth. Intrigue and suspense play a big role in this is a story of greed and how it can destroy all a family holds dear: each other. I recommend this book, a perfect antidote to a cold wintry day along with a rich cup of coffee. Award winning author Amanda Cabot has another hit with her latest novel, With Autumn Returns. I was hooked from the first page and only stopped 92 pages later because it was nearly midnight and the pages blurred. Picking it up as soon as possible the next morning I finished it early that night. I enjoyed other books by Amanda Cabot so the prospect of reading about Dr. Elizabeth Harding warmed me while I had the chill of a winter's virus on board. Dr. Harding is a strong young woman who faced many obstacles at medical school where her fellow students and professors, all men, expected her to fail. She heard repeatedly that a woman's place was in the home and the most she could hope for in a medical career was a position as midwife. Nobody would want to be treated by a lady doctor. The year is 1887 in the Wyoming Territory and the city of Cheyenne. When Elizabeth stepped down from the train she felt this was where she was meant to be; a modern city full of possibilities. Her sister had found the perfect building for her practice, ordered all the equipment and furniture according to Elizabeth's specifications. She would simply need to hang out her sign that she was open for business. The office next to her belonged to handsome attorney Jason Nordling. Their attraction to each other got off on the wrong foot when he pointed out that nobody would want to see a lady doctor, most of all him! The town did not welcome her as Jason predicted and she became fodder for gossip and mistrust. She found herself spending most of her time alone waiting for patients until she is contacted for monthly care for twelve women from the town's bordello. When diphtheria threatens to take some of the townspeople, she uses her medical training and modern methods unheard of in Cheyenne to treat her patients. Dr Wortling, the town's other doctor uses patent medicines and leeches on his patients in addition to harsh lectures on the evils of Elizabeth's methods. Jason and Elizabeth form an unlikely partnership that I hoped would turn to love. She, who would remain a doctor and he who wanted only a full time wife and mother seemed at polar opposites. Instead a friendship begins and he soon learns of her skills and knowledge as a doctor. She learns what a good attorney with integrity and loyalty. The author reels you into the story but keeps your attention with believable characters who face issues just as valid today as in 1887. We have come far in our world with the acceptance of women as doctors who possess the gift of healing. Take a trip back to the old west and visit a time of adventure with people who forged ahead under difficult circumstances to accomplish so much for the future.